Update: So, after wearing the low-top laceless Converse All Stars, I realized that my feet just didn’t work too well with that shoe. I need some more support and those shoes just weren’t giving me that. So I went back and exchanged them for a pair of Chuck Taylor hi-tops with laces. I’m currently trying them with some orthotics in them and they feel great! Plus it’s kind of fun to have hi-tops again. I’m very pleased with this pair. I’ve wanted a pair of Chuck Taylor All Stars since I was in middle school. I never got them then. And then I wanted some in high school – but still didn’t get them for some reason. Then in college, I thought about it again. And I think I went out looking for them one day but just didn’t get around to buying them – don’t know why. However, Sarah thinks they’re a little bit ridiculous. She says if I were tall & lanky, I could pull them off (skinny jeans would probably help as well). 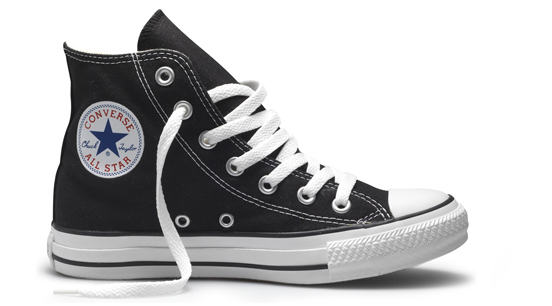 But I’m not tall and lanky…and I’m not in high school anymore – but dang it, I have my Chuck Taylor All Stars now. They are a very comfortable shoe – and it’s not that wearing them makes me feel like I’m back in high school…I’m not sure entirely sure what it is, but I just really like them. They’re fun shoes. And they kind of make me take myself a little less serious…which is probably a good thing for everyone. Is there something that you always wanted to get when you were younger? Did you get it? Why not…? And if not – why not get it now? I got my first pair of Chuck Taylors (we called them Converse All-Stars) in 9th grade in 1971 and paid $9 for them. My mother was shocked at the price. I got my first pair of Chuck Taylors (we called them Converse All-Stars) in 9th grade in 1971 and paid $9 for them. My mother was shocked at the price. At how HIGH it was. i am not tall and lanky but wear mine with pride. i do wear them w/ skinny jeans and not skinny jeans and they look great with either. So sorry you had to return them. Maybe the laceup ones would fit better for you?